When it comes to getting the job done in the modern marketplace, superior tools always lead to superior results for your team. At the top of this list should be the 2015 Mercedes-Benz Sprinter 2500 Crew Van, built with all the amenities necessary to get the most our of your team for a job on the go. Walter's Mercedes-Benz of Riverside, our trusted Mercedes-Benz Sprinter dealer serving Corona, will be a great location to find the 2015 Mercedes-Benz Sprinter 2500 Crew Van, coming soon to dealerships nationwide. 2015 Mercedes-Benz Sprinter ExteriorPowered by a 2-Stage Turbocharged Diesel engine, the Sprinter Crew Van is built to provide all the pulling power you need with up to 265 lb.-ft. of torque at a low 1,400 rpm. A 7G-TRONIC® Transmission is also in the cards with a seven-speed advancement to reduce interior noise and deliver a smoother overall ride.Matched with BlueEFFICIENCY® technology for heightened efficiency as well, your van can save money and time in the long run while avoiding the pump. A redesigned exterior is great for putting your business on full display, with ample space available for customization and branding with your company colors and logos. Complemented by the bold profile of the vehicle and an aggressive front end, this distinct look is great fro showing your team means business. 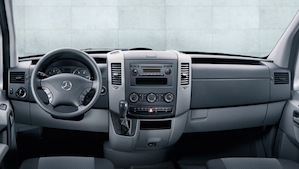 To further imagine the possibilities, the team at our Corona Mercedes-Benz Sprinter dealer can help you get a great look for your business’s personal needs. 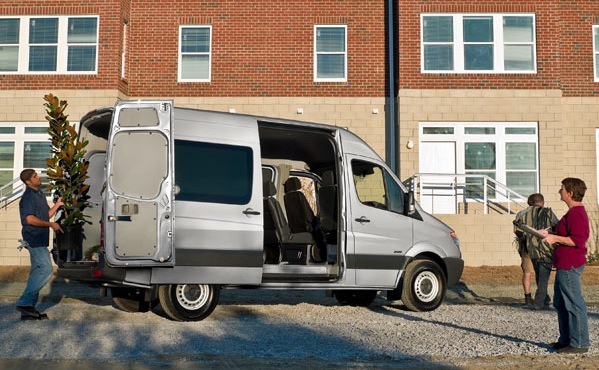 Your team could be spending a lot of time in this vehicle with a lot of miles along the way, so a comfortable and flexible interior is a must for a cargo van. Thankfully the Sprinter 2500 Crew Van is designed for a relaxing and supportive cabin, reducing stress to boost productivity on the job.Our hand-crafted seats are also put together with durable upholstery, built to last through years of everyday where and tear that comes with a company on the move. A 5.8″ color display in the interior is also great for keeping your team on the right path, with built-in navigation available for convenient directions. Entertainment is also possible with this feature and a standard Audio 15 head unit, including iPod® interface, USB connection and more. After all, when a long day at work is complete, there’s nothing more deserved than an enjoyable ride home. With crew or cargo in tow, safety should be at the top of the priorities for your work van. Technological bumps such as Bling Sport Assist and Lane Keeping Assist truly set Mercedes-Benz and Sprinter apart, with COLLISION PREVENTION ASSIST® also in line as part of the Active Safety Plus Package. 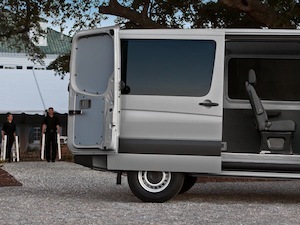 For more information on the upcoming 2015 Mercedes-Benz Sprinter 2500 Crew Van at Walter's Mercedes-Benz of Riverside, please contact our Orange County Mercedes-Benz Sprinter dealer by calling 888-294-6772!